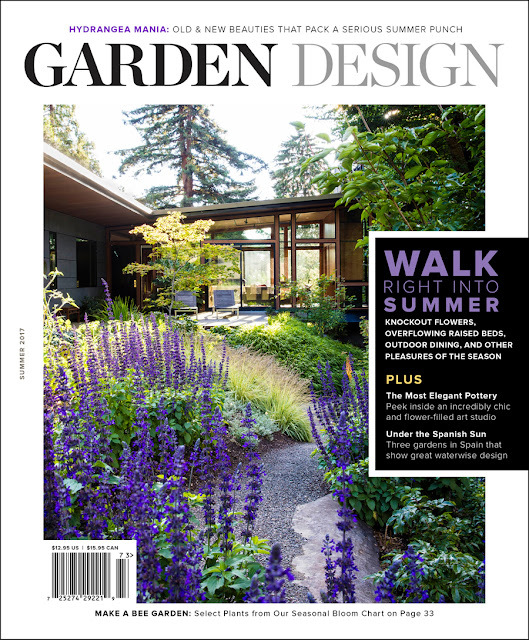 danger garden: Garden Design Magazine, win a year's subscription! Garden Design Magazine, win a year's subscription! Summer 2014 was the first issue of the current magazine — although it wasn't a completely new title — Garden Design in another form was a well-known (and loved, by some) publication. Once the earlier version ceased to publish Jim Peterson bought the brand and reinvented it. The "new" Garden Design is completely ad free, published four times a year, and bookshelf worthy. I've had the pleasure of meeting Jim, and his wife Valerie, on multiple occasions (Garden Bloggers Flings, which the magazine generously sponsors, the Northwest Flower and Garden Show, etc) I know the people behind this magazine are warm, genuine, human beings who support the gardening community beyond the pages of the magazine. This feels very much like a family affair, one which just happens to write about amazing gardens, take gorgeous photos, and feature them in print. If you've never seen the magazine in person, here's a short (2 minute) video that gives you an idea of the stories they cover, and the way in which they do it. If you're not signed up for their weekly newsletter you really should be, seriously. It arrives in your inbox every Thursday and has links to great stories on their website, a calendar of events happening around the country, other blogs you should be reading (I'm a little biased, they have featured danger garden a couple of times) and so much more. Sign up here. So enough of my chatter...are you interested? Perhaps you've seen the magazine and liked it, but never taken the plunge and subscribed? Perhaps you're already a subscriber (good for you!) but you'd like to give a subscription to a friend, or family member? Well... here's your chance. 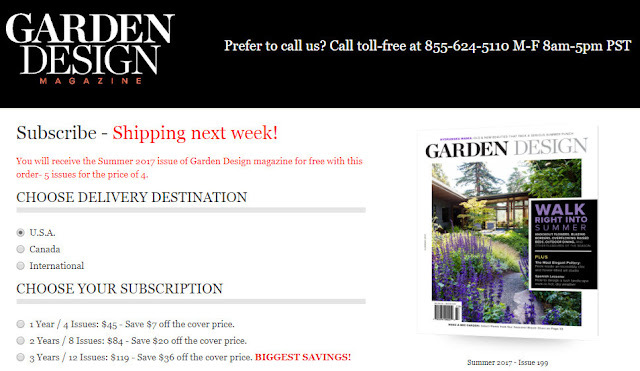 The fine folks at Garden Design are letting me give away a year's subscription! This coming Friday, August 25th I will draw one lucky winner from all who comment on this post by midnight on the 24th. As always you MUST leave a way for me to get a hold of you, so I can get your mailing address. If your comment doesn't link to an active blog (no Google Plus accounts) then leave an email. You can write it out like "audrey at gmail dot com" if you want to deter the spam-bots from finding you. Oh and U.S. residents only please, I'm sorry but you know...shipping costs. Maybe you want to go ahead and subscribe right now? Then I've still got a deal for you — get your first issue free! That means the summer issue ships to you now, then you've still got a whole year ahead to enjoy your subscription! Go online www.gardendesign.com/2017 or call (855) 624-5110 Monday – Friday, 8am–5pm PST and mention this offer. Enjoy! It's a beautiful magazine and the people behind it are, indeed, special. Don't enter me in the drawing as I already get the publication but what a great opportunity for some lucky person! I haven't had a chance to enjoy the new incarnation of Garden Design. I had enjoyed it in the past but lost touch with it when I lost having a local bookstore that stocked it. Although I already love and subscribe to Garden Design, I (rather foolishly) offered to pass on my issues to a dear friend who gardens. I occasionally manage to do that, but more frequently I find myself jealously holding on to the latest issue. I'm entering your give-away so I can gift her with her very own subscription! I would love a subscription. I started to subscribe about a month ago but decided against it - it is just too expensive. I was a happy subscriber to the former version where I learned so much. Love to have a subscription to the new one. I keep saying I need to subscribe to the new one. Jim does so much for us at each Fling and the magazine is so much better under his leadership. My young husband attends "Gardens and landscape design Project" at the university. He loves to study every kind of garden magazine; new ideas, information, updates, everything about gardens gives him energy to have a professional upgrade and to make him sure about his choice to study such an interesting subject. Thank you for this possibility. GD was a favorite 20 years ago, and I was pleased to see it reappear in such an appealing form -- but am now reluctant to spend garden dollars on anything but plants. A free sub would be a treat, one I'd share with likelier-to-subscribe friends!. I LOVED the old magazine and I subscribed to the new one for a couple of years but I recently let my subscription lapse. I appreciate the quality of the photos and articles but I haven't felt the connection with the content I once did - so many articles feature spaces beyond my aspirations (or the reach of my pocketbook) and don't translate into ideas I can apply to my own space. In the interest of full disclosure, I've dropped all but 2 of my garden magazines, and I used to subscribe to everything remotely garden-related. I do follow Garden Design's weekly newsletters, though, and the personal debate about renewing my subscription continues. I would love to win a subscription and check out this magazine--it looks lovely! It's a beautiful magazine and I love that it's ad-free. Would love to win! I'd love the chance to win a subscription. Thanks for the opportunity. Sweet! 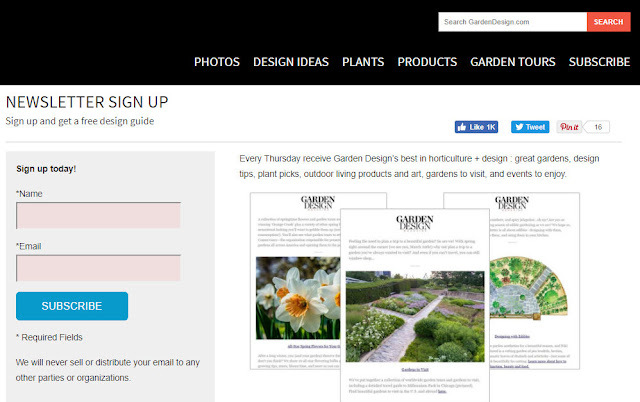 I already subscribe, so no need for entering your contest but a shout out to Garden Design and their quality (not just because they did a story on my garden...really!). Great publication, to be sure! Love Garden Design, even though all gardens are high end, lots of money invested, professional designs. Wish there was a mag for those of us gardening on a tight budget but still wanting a stylish garden. I would love a subscription to Garden Design Magazine!!! I also have babies of Verbascum olympicum that need new homes. I have thought of subscribing but never have. Would love to see what everyone is talking about. I would love a subscription to this magazine! I drool over this beautiful magazine but have never subscribed due to prohibitive cost. So THANKS for the opportunity to win a free subscription! Thank you for the opportunity - I love this magazine, and still have back issues from the 90's. Sorry Jocelyn, the deadline was midnight Aug 24th.